The Skype for Business for iOS app brings Skype for Business presence, instant messaging (IM), and voice and video calling to your mobile device. 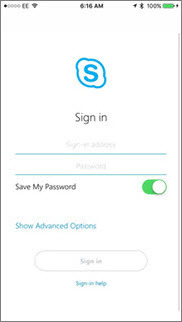 Important: To use Skype for Business for iOS you need a Skype for Business or Lync account—typically the same user name and password you use when signing in at work or school. If you're already using the desktop version of Skype for Business, then you have a Skype for Business account. From your phone, click the to go to the App Store and search for Skype for Business. On your iOS device, swipe each page of apps until you see the Skype for Business icon. Enter your sign-in address (for example, user@domain.com) and password, and then tap Sign In. You might be asked for both a user name and a sign-in address. The user name is what you use to sign in to your organization’s network, either user@domain.com or domain\username. Enter your mobile number with country and region codes. 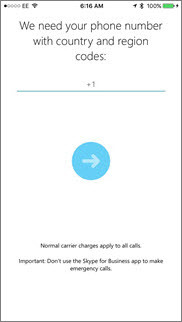 If you're an enterprise voice customer and Skype for Business can't use a Wi-Fi or cellular data network to make an audio or video call, you'll be called at this number and connected to the audio portion of the call. Accept the licensing agreement, and then click Done. To remove Skype for Business from your iOS device, tap and hold the Skype for Business icon until it shakes. Tap the "x" and then Delete.